Our lab is interested in somatic evolution. We are using a variety of systems-level approaches to study the origins and consequences of somatic variation, blending computational and high-throughput wet lab methods. Our main focus is carcinogenesis. We are interested in understanding how processes of mutation and selection in normal (stem) cells set the stage for cancer evolution. Then, once a tumor develops, how does tissue-specific selection shape the cancer genome? How can we take advantage of genetic intra-tumor heterogeneity to gain insights into the life history of a cancer? We are particularly interested in the evolution of metastasis. Do metastases arise from distinct clones with special, genetically encoded properties or do they represent random samples of the primary tumor? Does metastatic spread happen early or late in tumor development? Do all metastases arise independently from the primary tumor, or do they give rise to each other (Science 2017)? The answers to these questions have important clinical implications, but are difficult to study in human patients because it is challenging to reconstruct occult events that happened years before diagnosis. We have developed genetic techniques (PNAS 2014) to determine the clonal architecture and lineage of cancer cells in human specimens, and collaborate with clinicians in utilizing these tools to further our understanding of cancer evolution. A second interest of the lab is to elucidate how genes that control normal development and differentiation are implicated in cancer evolution. 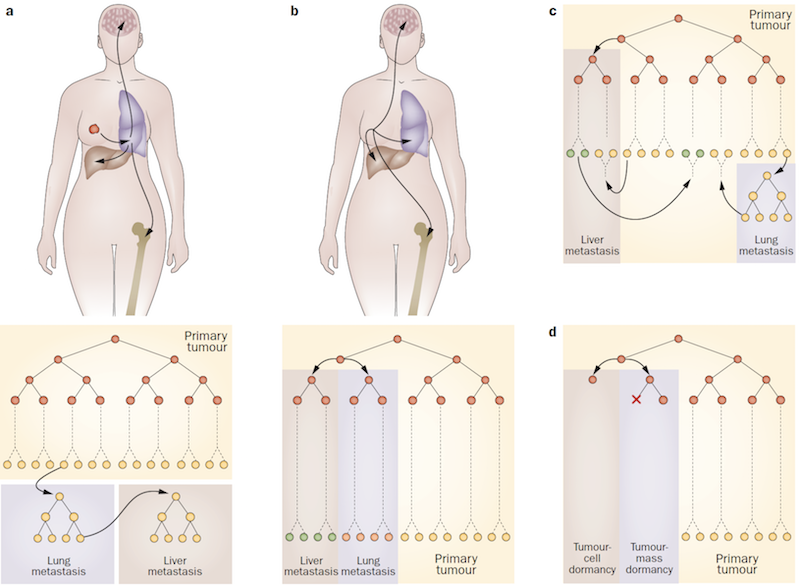 We have used computational analyses of genome-scale data sets to show that different tumor types recapitulate distinct developmental gene expression programs (Genome Biology 2008), lung cancers preferentially silence genes that are expressed in mature, fully differentiated lung epithelium (Oncogene 2012) and that in contrast to cancer, physiological liver regeneration does not require re-activation of embryonic gene expression (JBC 2007). We are now using high-throughput genetic screening approaches with CRISPR and overexpression libraries to discover novel genes that control development and carcinogenesis. Profound Tissue Specificity in Proliferation Control Underlies Cancer Drivers and Aneuploidy Patterns. 2018-07-16: Kamila Naxerova has been awarded the AACR NextGen Grants for Transformative Cancer Research. This award represents the AACR’s flagship funding initiative to stimulate highly innovative research from young investigators. Congratulations, Kamila! 2018-03-22: The Naxerova lab is looking for two new team members to study metastasis patterns in colorectal cancer and melanoma. Please read more details about the available positions here.